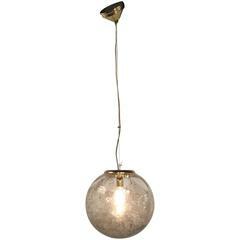 Italian globe pendant chandelier in clear bubbled glass with a wide band of white by Mazzega, circa 1970s. Sphere shaped Murano glass with inverted bottom and recessed socket. Takes one standard base light bulb. Chrome cylinder shaft, cap, circular chain and canopy. Glass measures 16" diameter by 14" high. 14" of chain. 5.5" diameter chrome canopy. Livio Seguso striped Murano blown art glass vase. Signed Des. L. Seguso. Clear glass vase with internal smokey slate gray vertical stripes and an opaque white horizontal band. Steel frame chrome-plated with one E27 bulb in the middle and our hand blow Mazzega glasses from the 1970's. 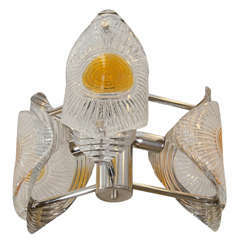 Midcentury hand blown Murano glass shade with an undulating double helix of amber an blue and five bulbs. Handblown textured glass in clear and white by Mazzega. Total height is 43' but the rod can be cut and the minimum height fully installed can be 30" Four lights 100 watt max. 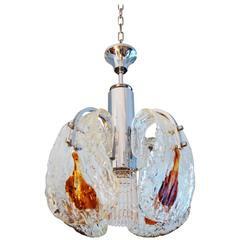 Five-light blown glass and chrome chandelier. Total height including all the chain 34.5" but can be fully installed at 18".